There are few college students who are not familiar with at least one well-known digital brand. 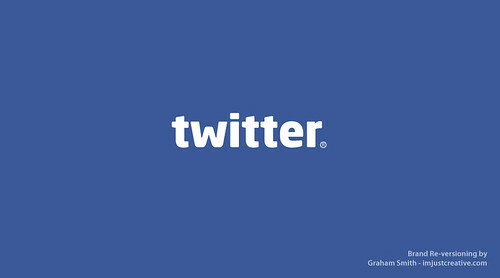 Staples such as Facebook, Twitter and Tumblr have blended seamlessly into our lives, dominating our day-to-day rituals. Casual actions like waking up and checking Facebook or browsing through BuzzFeed during a study break demonstrate the significant influence that digital brands hold. Edward Boches, an advertising professor at Boston University’s College of Communication, says that digital brands are significant in that they often serve a certain utility, which is changing the landscape of how the idea of a brand is defined. When one stops to think about how a digital brand such as Facebook became such an integral part of our social interactivity, the story becomes less clear. Yes, many digital brands arose to meet the growing market need for social media services. But how did the ideas behind Snapchat and Instagram turn into multi-million and billion dollar industries? Boches said he believes that there are certain factors that contribute to the success of a digital brand. One of these, he stated, is an available user base. What use would Instagram be if no one had instant access to a camera at all times of the day? Part of the company’s success is that it was able to take advantage of the utility of the modern camera phone while creating a digital platform that appealed to a wide audience. Appealing to a wide audience, according to Boches, can also be achieved by a frictionless user experience. However, any avid Instagram user can tell you that it is not all about the individual user experience. There is a great need for users to share their experiences with their network, and Instagram provides a digital space where that need can be met. Digital brands that effectively tap into an active user base will experience astounding results. Since its launch, Instagram boasts more than 200 million monthly users, 70% of whom log in at least once a day. Recognizing the success effectively cultivating and mobilizing a user base may yield, there are individuals who use the process of digital branding, through digital brands such as Facebook and Twitter, to promote themselves or an idea that they want to share. Many college students are familiar with the Twitter user @BostonTweet, who created a Twitter account in 2008 to promote local business activity during the economic downturn. Boasting 112 thousand followers as of April 13, account creator Tom O’Keefe has successfully marketed himself as a personal brand to the Boston area. According to Boches, this is just one example of how any individual can market themselves via emerging forms of digital media. It may not fit the traditional definition of a brand, but it is all part of an evolving transition that is changing the way that the public regards the traditional definition of a brand. According to Boches, anyone who is resourceful, determined and prolific could accomplish what @BostonTweet has done with the digital resources at their disposal. Boches added that though actual content creators comprise a smaller proportion of social media platforms than content distributors, generational changes have encouraged the increase in the percentage of content creators. With the ingrained idea that people have the power to manipulate the media, what are the future implications of digital brands and the process of digital branding? With more resources available, it is expected that the number of personal and digital brands will arise via the use of social media platforms. Burglary, arson and murder are all considered to be pretty terrible crimes, but one look at any number of ranting articles on the web could have one believing that there is no atrocity more heinous than that of the “selfie.” Yet they’re out there, and multiplying by the second. But are selfies really so bad? 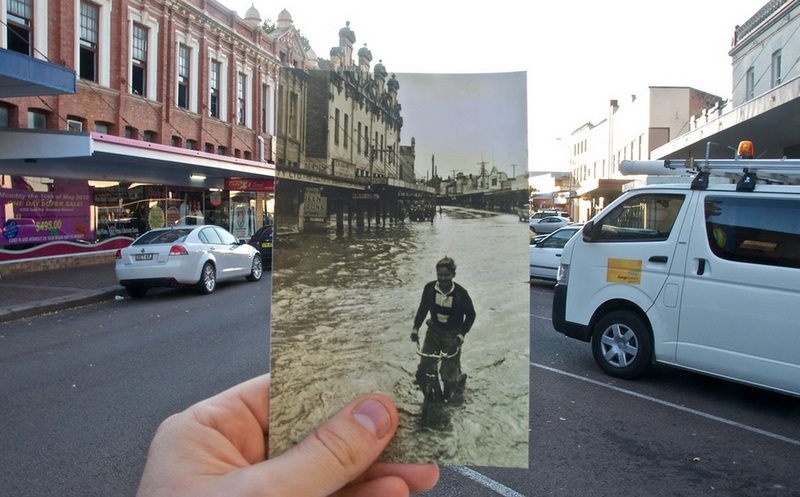 Though the term itself has become a recent phenomenon, selfies have long been a staple of social media. Come with me now to a simpler time, when Myspace reigned supreme in the kingdom of the internet. Ah, yes, I can see it now: the profile layout that you carefully selected after hours of scouring the web, that Dashboard Confessional song with just the right amount of angst for profile’s music player and, most importantly, your profile picture. You spent time on that photo, if not in staging it then in scrupulously selecting it from all those photos you took at your cousin’s wedding where your hair looked, like, so good. Myspace gave us the selfie, and we all embraced that sweet little nugget of vanity in our arms like it had come from the holy womb of Kate Middleton herself. In fact, if we really want to “Bill & Ted’s Excellent Adventure” this into the depths of history, any artist who has ever produced a self-portrait has engaged in the not-so-sacred practice of selfie-dom. Yes, these portraits vary in their realism (I’m looking at you, Van Gogh!) 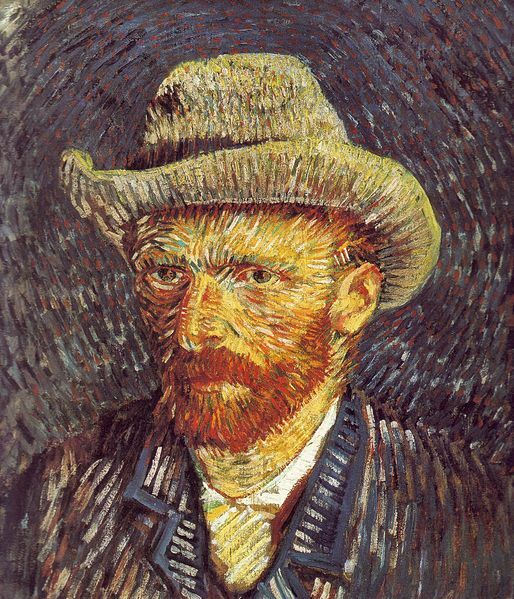 and require a certain level of artistry, but doesn’t every great selfie? Today, the tricks-of-the-trade are a soft-focus filter and a steady hand. And really, vanity is the social media endgame no matter what you’re posting. Sure, your Instagram might not be flooded with photos of your face, but it’s still a collection of the things that you see, the things that you experience. No matter what you’re posting about on Facebook, Twitter, Tumblr or Instagram, it all comes down to the bare-bones fact that you’re commanding followers and strangers all across this great internet nation of ours to care about you. Therefore, there’s nothing really so egregiously arrogant about wanting to share your cheesin’ mug with the rest of the world. Selfies should be something to praise, not to condemn. You’re looking and feeling good, and you should be encouraged to share that positivity with the rest of the world. Selfie on, Garth! However, no one knew that originally. At 3:30 p.m., I went with two friends to CVS to pick up green makeup and hairspray. Now, I was hoping that Ellen DeGeneres wasn’t super popular and no one would have read her Twitter challenge. That didn’t happen. The line for the cash register stretched back into the depths of the store. Armed with a Halloween set of paint and blue and yellow spray paint, we literally sprinted back to the dorm, ripping through our rooms for anything green or Sox. I wore a green t-shirt, green jeans (yeah, I own green jeans) and a fabulously assembled pair of red boxers on my head. After applying green eyeliner, I looked like a slightly more feminine version of Rosie the Riveter. Seriously. However, even in my green glory, I was a candle to the flame that was my next-door neighbor, who only wore a pair of green boxers and green body paint. We all wandered down to Marsh Plaza, where, shockingly, we weren’t the most outrageously dressed. There were people head-to-toe in thick green body paint, a Gilly suit (respect, respect) and someone who was literally draped in towels. I admit, I wanted the Red Sox tickets, but after an hour and a half of standing out in the cold and drizzle, I was ready to go home. I took my tight pants and my aching shoulders — we thought it would be a good idea for my friend to sit on my shoulders so that we got more attention. SPOILER ALERT: It sucked as an idea. Worst idea ever — back to Warren to take a warm shower of defeat. In the end, I didn’t get to see Ellen and I didn’t win Red Sox tickets. But I got to dress like an idiot with my friends and walk up and down the streets of Boston like a gypsy. Because when will I next get to be in college and dress in green and go crazy? May the Fashion be with You! Are you completely lost as to what to wear for Halloween? Are you allergic to dairy? I can help you with one of those two things. May the Fashion Be With You. Remember when Michael Jordan decided to pursue baseball? It was back in 1993 when he decided to step away from the NBA, which was the first of his three retirements. He signed a deal with the Chicago White Sox and played for their Double A-minor league affiliate for the 1994 season. His batting average was .202 with three homers and 51 RBIs. These stats weren’t bad for the NBA superstar but they were average compared to other minor leaguers fighting to be in the major leagues. I’m sure Jordan received a great deal of respect for attempting to try another sport, but we were all relieved when he returned to basketball in 1995. Lebron James, the current king of the NBA, recently revealed on Twitter that he too wants to pick up another sport: football. Well, not pick it up, but just play in one NFL game. Check out the tweet here. Before becoming a dominant force in the NBA, James played high school football in Akron, Ohio. Many believe that he could have played in the NFL, but I guess being the first pick in the 2003 NBA Draft made it clear which sport to pursue. Imagine being blessed with the skills to succeed in both pro basketball and football, two of the most body-abusing sports! Now, do you understand why he’s called King James? Plenty other athletes have also showed interest in other sports. Charles Barkley, an 11-time NBA All-Star, is known for having a terrible golf swing and was featured on a reality show that attempted to improve his golf skills. Michael Vick, the Philadelphia Eagles’ current quarterback, was drafted by the Rockies in 2000 as a starting pitcher. Then there’s Dave Winfield. Before he embarked on his Hall of Fame baseball career, he was drafted by four teams in three different sports. He was picked up the San Diego Padres (baseball) and drafted by the Vikings (football), the Hawks (NBA) and Stars (ABA). That’s just unheard of! Despite all the talk about James making an appearance in the NFL, it looks as if the Miami Heat star will return to the NBA to help his team win its third straight championship. His season begins on Oct. 29 when the Heat take on the Bulls. One thing I never thought I would share with the President of the United States? 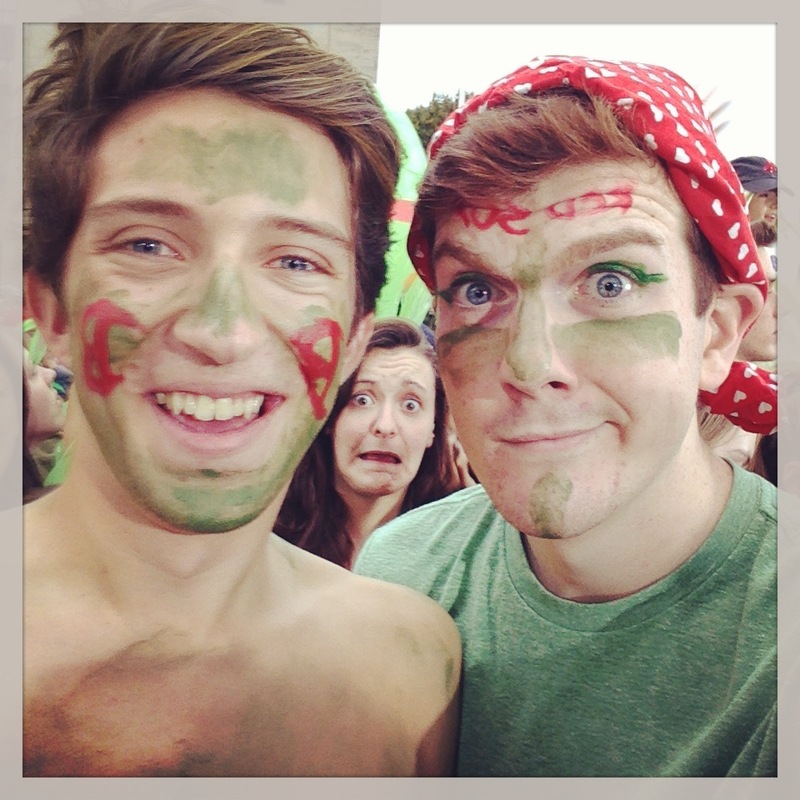 We both Vine. That’s right America; your President was recently featured in his very own Vine, a relatively new social media app that let’s you put together short video clips that you film on your smart phone. According to an article from Yahoo! News, the President’s first Vine features Bill Nye the Science Guy and PBS host LeVar Burton. They are promoting the third annual White House Science Fair, an event that encourages science and celebrates student winners and their projects from all over the country. 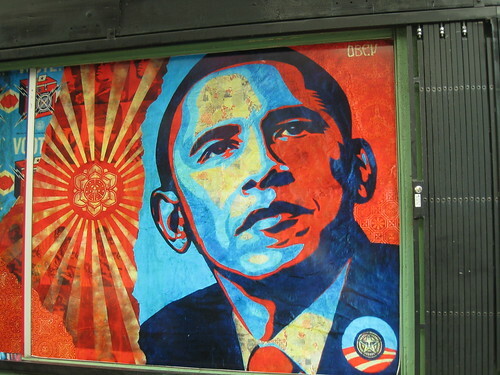 During this event, Obama goes from exhibit to exhibit examining different scientific and technological experiments and designs. Fortunately for all of us, this leads audiences to the White House’s second Vine post: Mr. President himself skillfully pedaling a stationary bike in his suit and tie, demonstrating the “bike-powered water filtration system”. This Vine is one step among many that the White House has been taking to immerse itself more fully in social media, which is a great thing to see. It takes our President down from the heightened position he has. Vine makes him seem far more approachable, more like a regular guy who also rides stationary bikes on the White House lawn to filter water. I would personally love to see more Vine videos to get a glimpse at the daily activities and events our President and the White House partake in. The Vine of our President on a bike is just another example of how social media has made our world smaller, bringing people closer to each other for better or worse. The White House also has a Twitter that let’s us know what’s going on up there on Capital Hill. Hopefully they keep it up. According to an article in the Wall Street Journal, Facebook plans on adding hashtags, the use of the pound symbol followed by a word or words, to its site. But hashtag usage has been mangled into something much more annoying. Within the past five and a half years or so, the evolution in use has gone from functional to bordering on the absurd. The hashtag’s overexposure has even led to a namesake baby, little Hashtag Jameson, born in November of last year, a controversy which sparked debate about the level of integration that the internet and social media have on our lives. I’ve often seen tweets composed solely of hashtags, (a.k.a ‘hashrash’), or the use of #hashtag, or the use of hashtags on Facebook (in case you didn’t notice, it doesn’t work; in fact, the hashtag becomes as useful as any other symbol on your keyboard outside of Twitter or Instagram). This last misuse prompted the founding of the Facebook page, “This is not Twitter. Hashtags don’t work here,” as well as multiple Youtube video rants about improper hashtag usage. There is even a Twitter etiquette page on hashtags.org that reminds Twitter users that “Peppering your tweets with too many hashtags is not only defeating the purpose of a hashtag but also very annoying to see. Expect to get unfollowed when you do this.” But some of use still don’t seem to grasp this concept. I hope I’m not the only one who grimaces a bit with the news of the addition of hashtags to Facebook. Twitter has always been a public broadcast network, and hashtags have only helped the site increase functionality; Facebook, however, has always been a more private and intimate means of social interaction. Hashtags make sense in a news-based context, but putting them on a social networking site can only further commercialize it. “#mbta you’re seriously cramping my style this morning. TWO B trains have gone by, too full to take on new passengers. #mbtaannoy,” one angry straphanger tweeted while waiting for her morning train to work. “cannot believe mbta green line operators are so pathetic and bored that they need to prohibit people from boarding an empty car. #mbtaannoy,” another T rider tweeted. 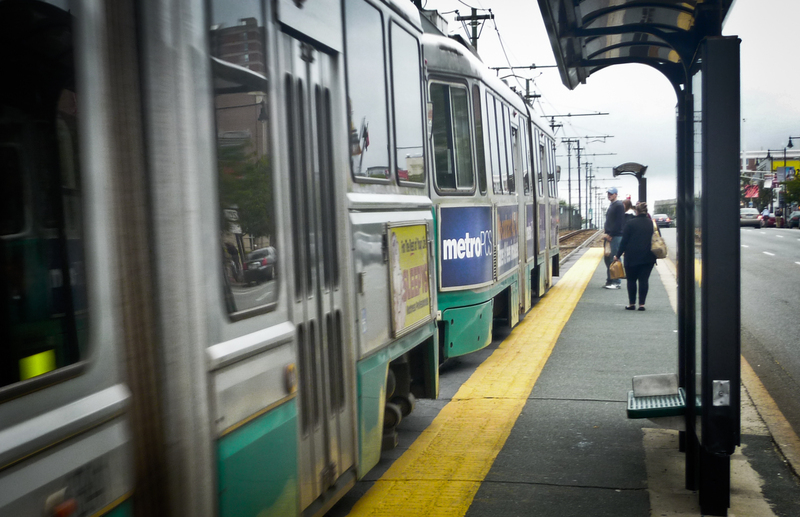 T riders have begun using Twitter as a social platform to voice their dissatisfaction with the Massachusetts Bay Transportation Authority. The tweets with the hashtag #MBTAannoy acknowledge a plethora of transit issues such as overcrowding of trains, long waits for buses and inadequate ventilation. Ranting about the MBTA via Twitter informs other prospective riders of transit troubles before they consider utilizing public transportation. According to Hashtags.org, the number of Tweets directed toward MBTA problems peaks during early morning hours, between 7 a.m. and 9 a.m. This fact reveals that the MBTA upsets commuters mostly during the morning rush hour when thousands of Bostonians are traveling to work and school. Boston University College of Arts and Sciences freshman Brittney Page, who regularly takes the T to her theater classes on Huntington Avenue, defended the MBTA. However, College of Communication freshman Alexis Felix said she disliked the T from the day she arrived on campus. As a native New Yorker, I can sympathize with the Boston straphangers. Every transportation system has its own glitches and problems. New York’s transportation authority is no different. Fare hikes and overcrowding are constant issues that plague New York’s MTA. However the MTA’s trains and buses run 24/7, which is the major difference between the MTA and MBTA. I don’t understand why the subway stops running after 12:45 a.m. when there are thousands of college students roaming Boston and neighboring areas. I’m also confused with the lack of train cars on the Green Line. Why can’t train cars be added to accommodate more passengers? These are the questions that fly around in the minds of the regular T riders. Since they haven’t received many sufficient answers to these questions, they turn to Twitter to illustrate their frustrations. 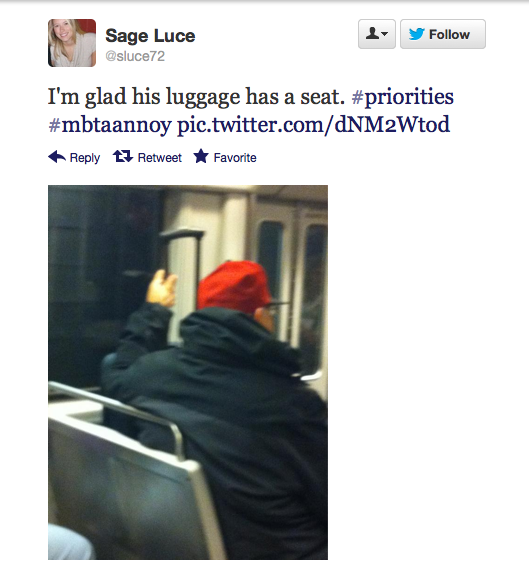 Though @mbtaGM often responds to Twitter users, #MBTAannoy seems to not have gotten any attention from MBTA officials. 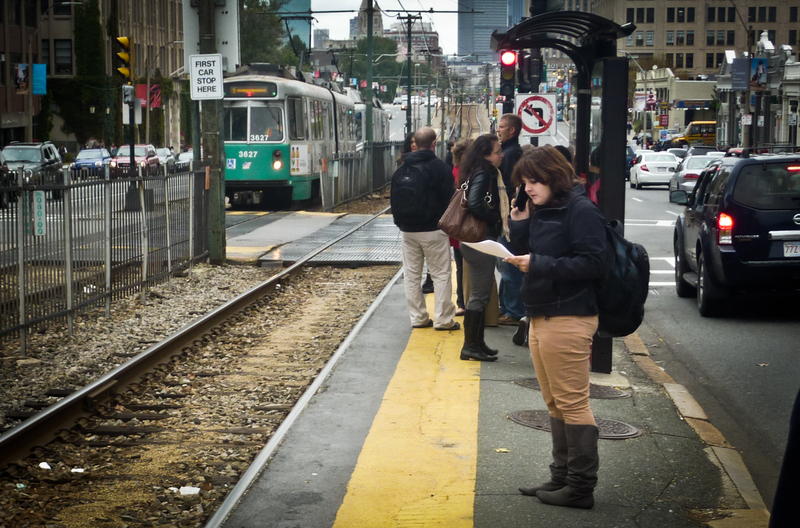 This in conjunction with Monday’s Green Line crash in Brigham Circle proves the MBTA better get its act together. What is the tallest mountain in the world? Who is the fastest man alive? What is the capital of Bangladesh? Where are you going to go to answer these questions? Let me guess… Google? You and around 82 percent of all other Americans. Google has become the master of all search engines, it’s the go-to instant-answering agent and a most reliable sage of knowledge, presenting any gamut of answers within seconds. But would you believe that Google is the most popular tech company in the United States—even more popular than Facebook? A new study shows that although people these days are constantly on their Facebook, Twitter, Tumblr and every other social-networking site possible, Google reigns over them all in popularity. Our generation is practically overwhelmed by technology. From iPhones to iPads and Macbooks, we have search engines attached to us wherever we go, and Google can provide an answer for just about anything in a matter of seconds to satisfy our curious minds. What does Facebook have on that? 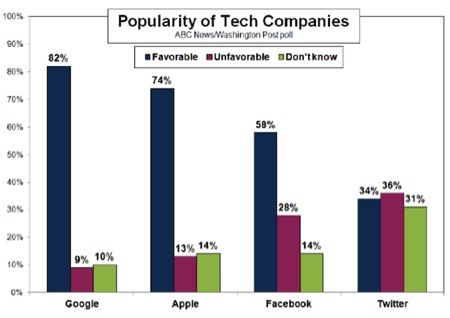 An ABC/Washington Post poll asked over 1,000 adults which tech company they found most favorable and which ones they found most unfavorable. Around 82 percent found Google the most favorable tech company over Apple, Facebook and Twitter. Another 53 percent even found the company “strongly” favorable. Most of the Google fans came from the younger age groups, who calculated at a strong 92 percent favorabilty for the popular search engine. College graduates clocked in at about 88 percent favorability, while the general public ranged around 66 percent. Google only had about 9 percent unfavorability, which is surprising given the organization owns so much. What is even more interesting is that while we often label current generations as the “social-networking obsessed” generation, Twitter’s voters surprised everyone by voting it as more unfavorable than favorable. An almost equivalent number didn’t care enough to vote either way. But Google’s diversity, versatility and convenient features like Google+, Google Chrome, Google Mail, and the hot, new creation Project Glass, puts it light-years ahead from the rest of the pack. With the new Project Glass, Google aims at creating an “augmented reality platform which would bring the benefits of Google’s mapping and social networking into real-world experiences,” say company reports. For instance, Project Glass would allow its beholder to Skype at any moment, allowing the receiver on the other end to see through the eyes of the beholder. But Larry Page, current CEO of Google, states he is incredibly satisfied with the success of Google’s features, but that is not the only thing he wants Google to be known for. In his published “Future Outlook” piece, he dedicates an entire section to the “love and trust” connection he hopes to establish with its users. He has been furiously working to improve Google’s features so that users can have the best experience possible. “It’s all about speeding things up so users can get on with the things that matter in their lives. That’s what we aim for,” said Page.